Monster brings together people and suitable job offerings. Thanks to customized solutions and the most progressive technology worldwide, Monster finds better candidates for the right job – in the Web, through mobile apps and strong partner sites, and also through social networks. Monster offers competent, personal consulting on the basis of an innovative range of products and services just as unique as the needs of customers. 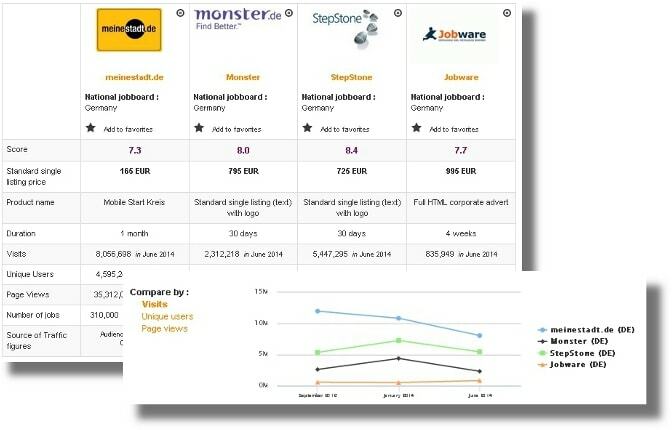 In Germany Monster is the best-known commercial online job board among job board users (Nielsen, July 2012). 29 of the companies listed in the German Stock Index (DAX) publish job ads on Monster (internal data, March 2011). Summary: In the world of job boards, Monster is, well, a monster of a job board. As some of you might know, Monster was sold to Randstad, a huge international staffing company, in 2016, which did not help the job site regain its leading position as hoped unfortunately. Instead, Monster continues to struggle to maintain its prestigious reputation. That said, the German version is more than adequate and offers its users more than just job board tools. It gets as many as 2.68 million views a month (despite a slight dip recently) and it has an impressive range of Youtube videos, as well as 734 604 Facebook followers, 5 093 on Youtube, 1 246 on Twitter and 662 Instagram. Design: The familiar purple monster is the backdrop on the homepage. The search engine is in two parts (keywords and location) and you must write a keyword to start your search. The rest of the homepage presents the job board as a whole: the services, the articles, the survey, the popular industries, the popular companies, the popular locations, why you should register, Youtube videos and finally, a bit about Monster. The company pages are customized to suit the company and so the information varies from one to another (from maps, photos, videos and logos, to descriptions, benefits, useful information and current positions). If you would like to browse the company pages (about 105), the “all the companies” button is not working, but you can filter the search and then remove the filters. As for the job listing, it features the important information (Location, position, publication date and company) and often shows one job offer next to a list of all the others corresponding searches. As for the filters, they are fairly limited: the job title, the location, the country and the company. The job offers: It’s difficult to say how many job offers there are, since you need a keyword to search. Since it’s Monster, it’s safe to say they often all kinds of jobs. Special features: The (employee satisfaction) survey, the blog, the CV templates, the cover letter templates; the Youtube videos; the app; #thatsnext; the TRUSTe Feedback button; the CV parser. 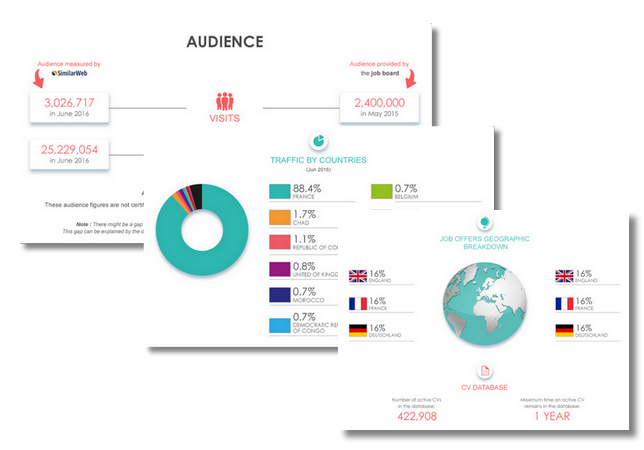 Verdict: Monster continues to be a big player in the world of recruiting and job searching in Germany. The keyword requirement is a bit annoying, but Monster definitely has enough to offer its users.